I would say that we eat chicken about 3 times a month. Sometimes we have wings, breast or I get fancy and cook a whole chicken. I like the whole chicken because I can then make my own chicken broth..YUM. So, you know me...I see what I have and whip it up. I had just bought a bag of Corn Chips. 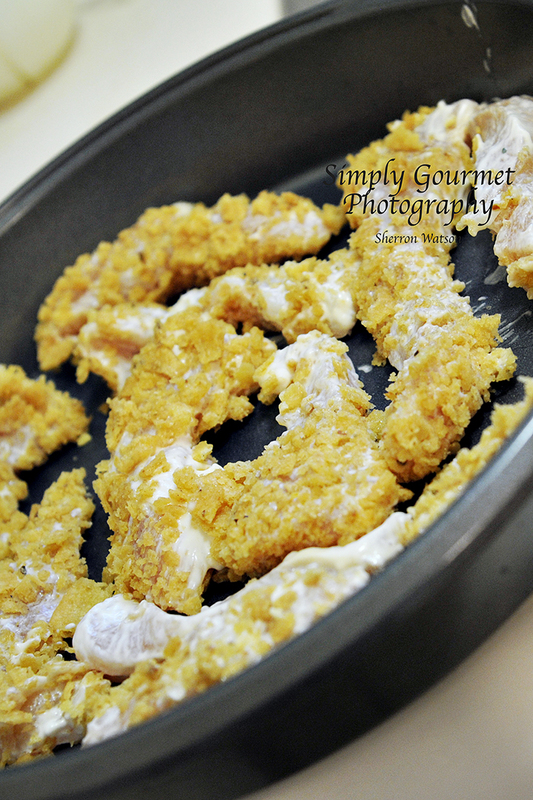 What could I make with corn chips and chicken...FINGERS! Let the cooking begin! 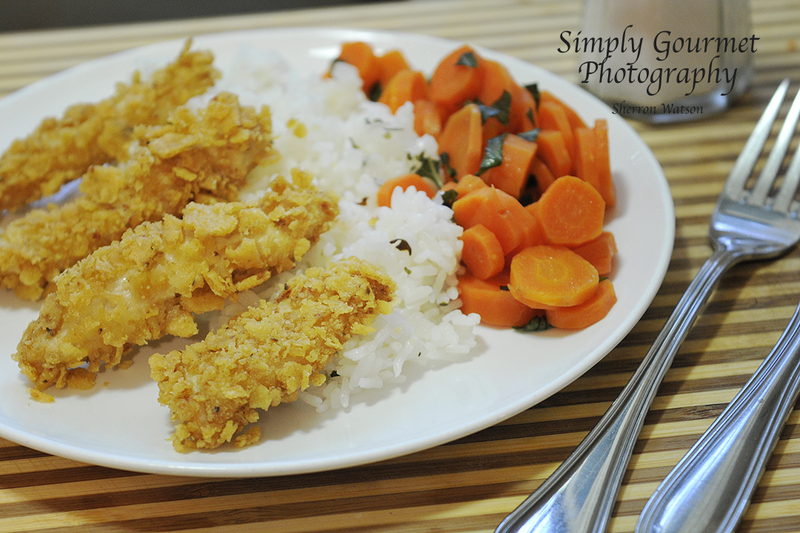 It was quick, involved my family and we ate the best Chicken Fingers we have ever had. Super EASY too. 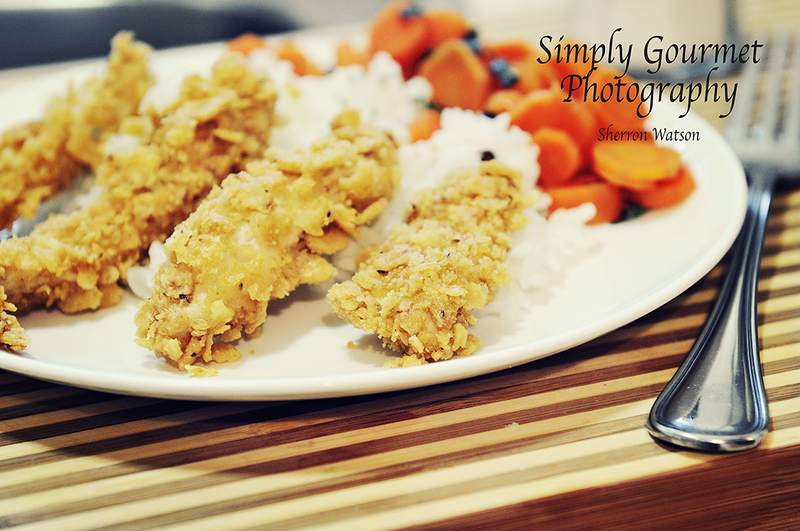 We ate our Fingers with steamed carrots and rice. Both items were able to be made while the chicken was being cooked. I used a non stick cake pan for the rest of the fingers. Even though it was non stick, the topping still stuck..BOO HOO. I would use parchment paper, those fingers did not stick at all! 2-3 cups of Frito Corn Chips, crushed . Use a large bag and rolling pin. 1. Preheat oven to 400 degrees. Line a cookie sheet with parchment paper. 2. Lets make this easy AND mess free. HOW? Take a large storage bag and add your mayonnaise and mustard. Mix together by squeezing the outside of the bag. Once combined well, add the chicken fingers. Again, using the bag, combine the chicken with the mayo/mustard. 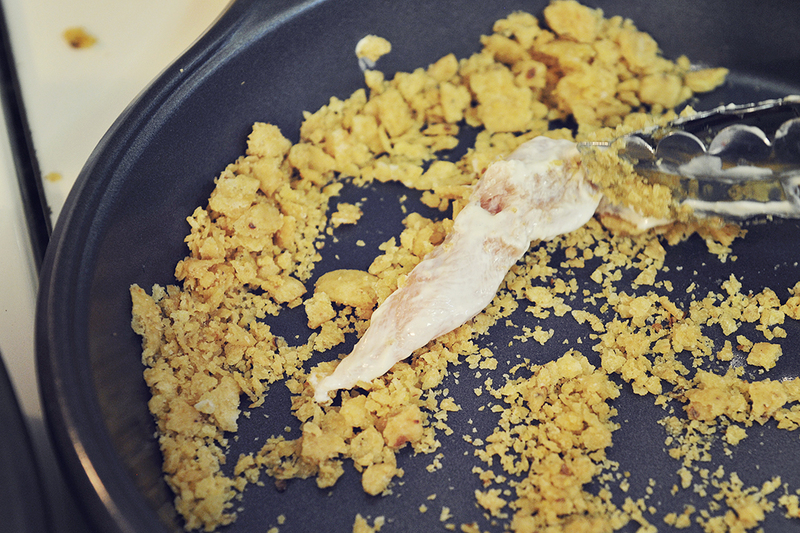 You don't want the chicken to be CAKED with mayo, just coated. This allows the corn chips to stick really well to the chicken. You can use an egg/milk mix too, but the corn chips are heavier than flour and you need some real sticking power to make it work well. This picture shows you how small my corn chips were crushed. I liked the consistency I used. It was not too big or too small. Keep in mind that the more chips you put on the fingers, you may need to add more crushed chips to the recipe. 3. 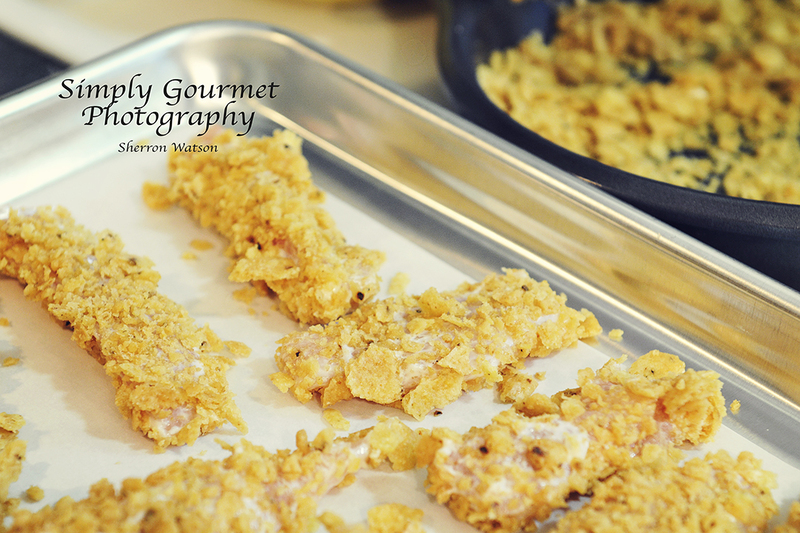 I used a pair of long metal tongs and removed each piece of chicken and dipped them into the crushed corn chips. The tongs work great to maneuver the chicken in the chips crumbs. Bake chicken for 20 minutes. 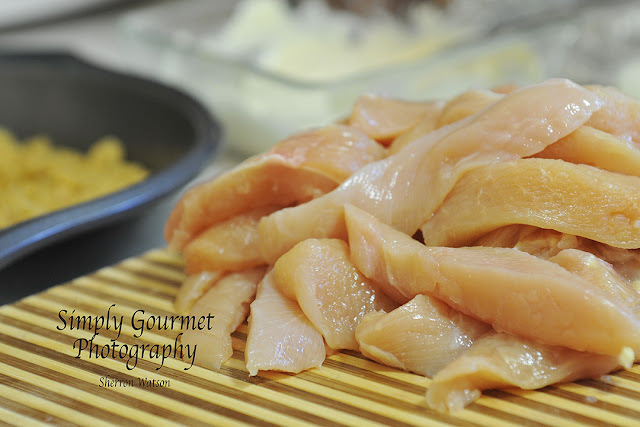 I can tell if chicken is done by pressing on it, if it's squishy..not done. If it's firm...done. It's easy...take the chicken out of the bag with the tongs and coat both sides. No messy fingers for the "Fingers". I served the fingers with BBQ sauce and Honey Mustard. The BBQ was store bought and the Honey Mustard I made. Use equal parts honey and mustard mixed with a little bit of mayonnaise. The mayonnaise gives it a milder flavor, the right creamy color too. Oh my, this looks so delicious! Chicken breast and carrots, for me it is a perfect combination of flavors, and definitely makes a wonderful and tasty dinner :) Love your photos Sherron!